Like the cobbler’s shoeless kids, we PR professionals are terrible at explaining what we do. Media commentator Roy Greenslade, who ought to know better, likes to say that “there are now 4.6 PRs to every one journalist,” as if that means something. First, it’s never correct to refer to “a PR” unless you’re talking about a pimple reducer, pub regular, pistol refinisher, puppy renter, or something else that has nothing to do with the profession of public relations. You can call me a public relations professional, PR manager, PR counselor or even a PR guy, and I’ll answer to it. Call me “a PR” and you may shortly decide I’m also Pretty Rankled. But enough of that. Let’s get to the core of my annoyance at the “4.6 PRs per journalist” nonsense. Journalists naturally see only a tiny sliver of the public relations professional’s role. In truth, media relations is such a minor piece of our pie that in the 10-week course to prepare fellow PR professionals to take the Universal Accreditation test, we typically spend less than 10 or 15 minutes on it. After all, it makes up only about 5 percent of the candidate’s score. A lot of reporters who “go into PR” thinking they already know the business get a rude awakening, as I did when I made that transition in 1984. To be fair, journalists aren’t the only ones who think they’re the center of the PR professional’s universe. Just this week, New York’s Joint Commission on Public Ethics (Jcope) adopted an advisory opinion that many of my colleagues feel would require many PR professionals to register as lobbyists. Remember that accreditation exam I mentioned a minute ago? Yeah, lobbying also makes up an itty bitty portion of the score – so little that we barely mention it in our accreditation training course. Public relations is the management function that identifies, establishes and maintains mutually beneficial relationships between an organization and the various publics on whom its success or failure depends. This comes right out of Effective Public Relations, the standard textbook for more than a half century – and still (several updates later) the ultimate authority. 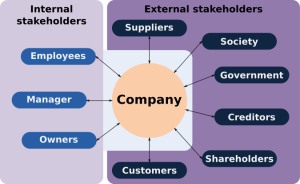 Here’s the reality behind what we do: Every organization has a large number of “publics” (more fashionably called “stakeholders” since the 1980s) on which its success and even survival depend. The PR professional (working with other disciplines) figures out who those publics are and how to get along with them. There’s a lot of give and take. And it all happens within a strict code of ethics. If that seems like a pretty big universe, it’s because it is. Turns out that identifying, establishing and maintaining mutually beneficial relationships with all the folks who can make you rich (or put you out of business) is a pretty big deal. Right now, you may be feeling skeptical. 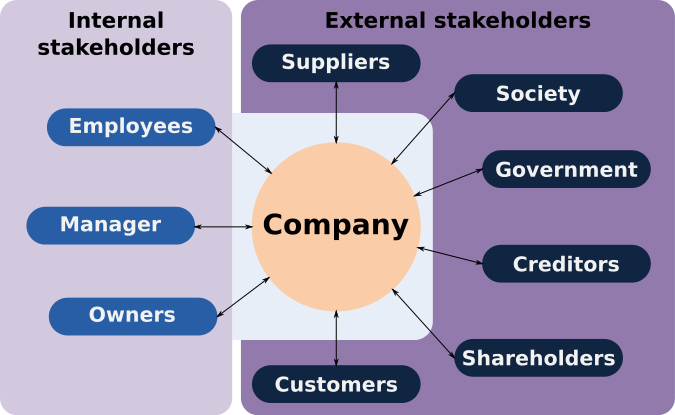 But let’s think for a moment about this business of relationships with important stakeholders. Obviously, your stockholders can do you in. We’ve seen countless companies go under because investors lost faith and sold to the point where the stock price practically disappeared. On the other end of the scale, there’s Apple, which has the highest market value of any company in the U.S. mainly because stockholders believe in it. Customers? Sure. Right now Chipotle and Blue Bell Ice Cream are fighting for their lives because people got sick eating their food and customers lost confidence. That brings other stakeholders into the picture as well — notably, regulators who decide if the food we eat is safe. It’s not much of a stretch to expect the Securities and Exchange Commission to take an interest in whether insiders may have sold stock before its troubles were revealed to outside investors. That kind of thing can lead to time in the slammer (ask Martha Stewart). Banks can end a company’s life by pulling credit lines. Customers can do the same by choosing not to buy. Because of the number of “publics” on which any business or institution depends, the discipline of public relations has evolved to help manage those relationships. It includes not only what we say, but also what we do. So public relations counselors and staffs spend a lot of time advising top management on policy and corporate behavior. Because if your food is making people sick, you can’t just paper over it with a lot of pretty words and pictures about your wholesome goodness. So PR includes both action (Sell food that doesn’t make people sick.) and communication (You’ll love our new garden burgers.). In doing all of this, we work with other disciplines — sometimes advising, sometimes conforming. We have to understand and abide by laws ranging from copyright to postal regulations to financial reporting. A properly trained PR professional will know how to conduct formal and informal research and will know valid research from junk. He or she will know how to build a measurable plan that supports the client organization’s goals with concrete and useful activities that will help ensure success. To be sure, hardly any PR pros do all this stuff any more than all baseball players pitch. Most of us evolve into one area or another, but we have to know the whole picture. Some measure public opinion. Some counsel top management on corporate policy. Some lobby. Some of us (like me) even talk to reporters. If you find it ironic that we public relations professionals do such a lousy job of explaining what we do, don’t worry. I do too. So maybe this will help just a little. Just do me a favor and don’t call me a PR. Carl Carter, APR, is president of NewMediaRules and a 30-year public relations veteran. He can be reached at 205-378-9290 or carl@newmediarules.com.